Bask in softly filtered natural lighting and enjoy the breeze in an open air, natural environment. No, this is not a new cafe offering an al fresco dining experience. Welcome to Coney Island, Singapore’s newest nature park! Although it was only recently opened to public, Coney Island is already the must visit destination for Insta-hippies with its wild grassy look coupled with a soft textured backdrop provided by the Casuarina trees. The island projects a sense of nostalgia, transporting you back to a time where roads were just dirt paths from clearing vegetation and where amenities were primitive. Look out for hanging nests that were intrinsically weaved by the Baya weaver birds along the main path or try spotting the lone Brahm cow that has called the island home. Also, hidden among the mangroves is a villa built by the Haw Par brothers! However, to avoid being caught by the tides, we highly recommend that you sign up for the free guided tour provided by NParks, should you wish to visit and snap an Insta-worthy picture! Start your journey from Punggol Point (Do stock up on water from the 7-11 convenience store and relieve yourself at Punggol Settlement before you begin your trek) and follow the signs, or the crowd, towards Coney Island. There are 2 entrances to Coney Island, but everyone enters from the western entrance, which is the entrance nearest to Punggol Point. Oh, and do watch out for sandflies, especially at the beaches! Remember to go prepared and properly covered! Read: Guide to Coney Island – Here’s what to expect before you go. Psst! Have you heard about dragons living in Sentosa? Or that an ancient civilization once existed on the island? Unleash your inner Indiana Jones and set out in search for the elusive dragon and that glittery Mayan gold “buried” in the heart of Sentosa! Mention Sentosa to anyone and the first replies are usually to do with getting a tan on one of her beaches or the adrenaline rush that comes with Universal Studios. It is, after all, The State of Fun and there are countless activities one can partake in for a memorable day in Sentosa. But for the avid naturalist who scorns the highly urbanised nature of attractions on the island, gear yourself up for a day of sweat and insect bites and explore the trails in Sentosa. Make your way up the escalators to Imbiah Lookout and head to Sentosa Nature Discovery (previously known as the Butterfly Park Sentosa Monorail station). Pick up some nature watching skills here before heading off into the trails. 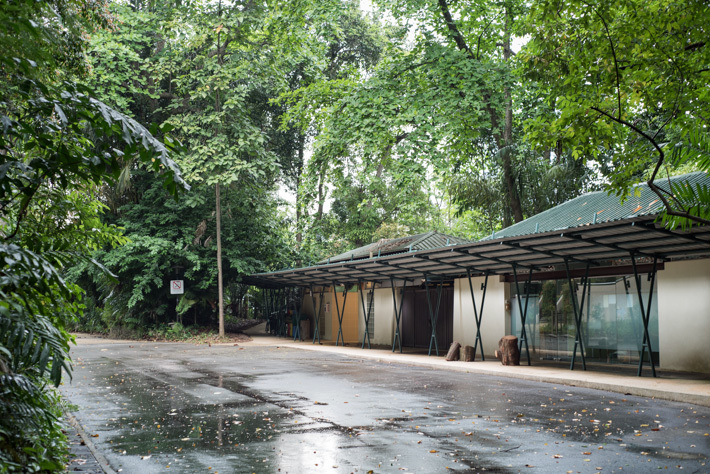 The many hidden structures sprawled across the trails – relics of some of Sentosa’s former attractions – bring back memories for many who have visited Sentosa in the past and gives it a sense of nostalgia. Enjoy the rewarding breeze and view on the Siloso Skywalk at the end of the trail. It’ll be worth it! 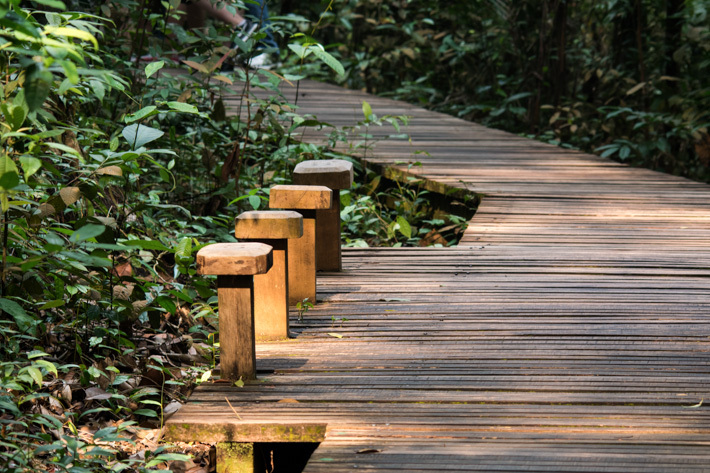 Challenge yourself to a journey through Singapore’s rainforests in this one heck of a trail. The first in Singapore, Macritchie Reservoir is steeped in history and houses many “easter eggs” to be discovered! Did you know that World War II hero Lim Bo Seng’s tomb is situated on a hill in the Reservoir Park? Or that there used to be a Japanese Shrine during the Japanese Occupation? 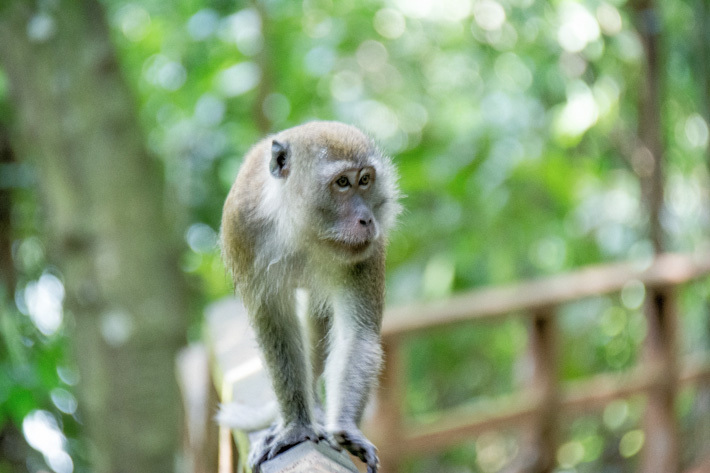 Start from the trails at the eastern end of the reservoir, and make your way around the reservoir as you watch the macaques frolicking about in the trees or marvel at tree-climbing monitor lizards! 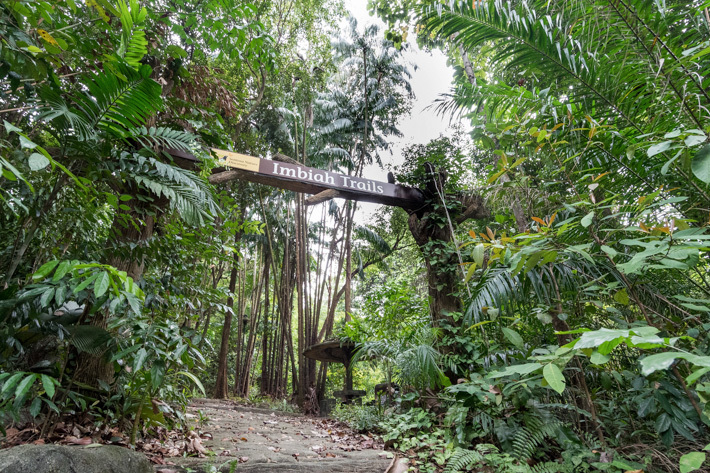 Take a short detour to the TreeTop Walk and soak in the sights and sounds above the canopy, before making your way onto Rifle Range Road, and turn right onto the Kampong Trail near the end of Rifle Range Road. This will bring you to the entrance of Bukit Timah Nature Reserve. If you are still feeling energetic at this point, challenge yourself and get to the summit of Bukit Timah Hill! 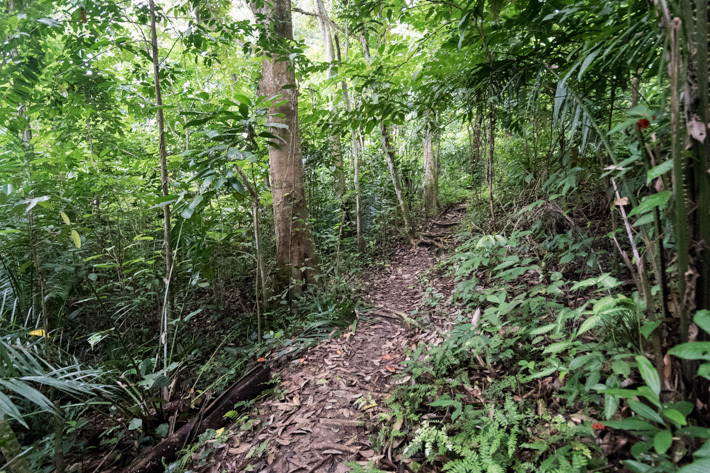 PS: Do note that Bukit Timah Nature Reserve is currently undergoing restoration works and access to the summit is only possible via the Summit Trail. The trail is also opened only on weekends from 7am-6pm. Before Hay Dairies in Lim Chu Kang, there was a dairy farm owned by the Cold Storage group right in the middle of the island. The farm has since ceased operations, but its legacy lives on with a road and, subsequently, a park, so very aptly named Dairy Farm. Located on the periphery of Bukit Timah Nature Reserve, Dairy Farm Nature Park is one of a number of nature parks which were recently created to act as green buffers for Bukit Timah and the Central Catchment nature reserves. Start off at the Wallace Education Centre, which was converted from an old cow shed and learn more about the history of the park. 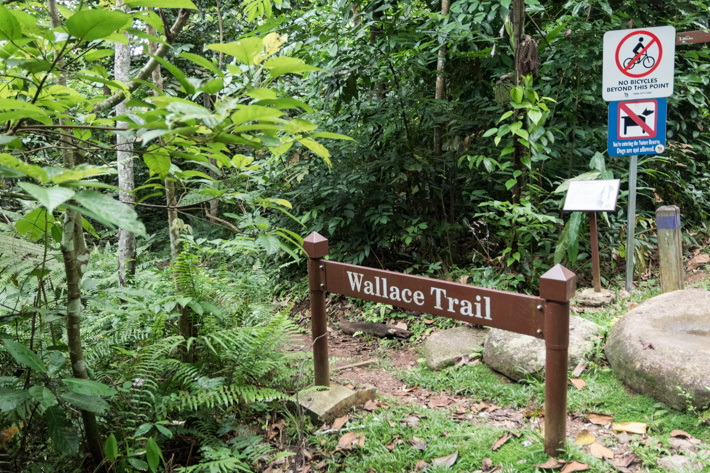 Trek into Wallace Trail and look out for traces of an old kampong that once populate Dairy Farm Nature Park, or the durian trees that line the trail. After leaving the jungle, take a slow walk to the Singapore Quarry to enjoy the breeze as you cool down and while taking in the majestic views of the quarry. Getting to Dairy Farm Nature Park has also just gotten a lot easier! With the opening of Phase 2 of the Downtown line, the new Hillview MRT station brings you right smack in the middle of Dairy Farm Nature Park’s hiking trail at Carpark A. Simply hop off the train and begin your adventure! Protected by the dead. That would most probably be the best and most appropriate description for Bidadari Park. Formerly a muslim cemetery, the sacredness of the place gave the lush greenery the protection it needed. Bidadari, with its diversity of migratory birds and numerous species of resident birds such as Woodpeckers and Kingfishers, is a paradise for birdwatchers. It is wild, unkempt, and its tracks are carved out by nature enthusiasts who frequent the park. Walk around the forested area and listen out for the various bird calls. Alternatively, try talking to some of the birdwatchers and they may point you to a rarely seen bird perched high up on the trees. Located right beside Woodleigh MRT, getting to Bidadari Park is easy. However, those looking to visit Bidadari would have to do it soon. The area is slated for redevelopment and one wonders how much longer this green patch can remain untouched. Hidden in a corner of Tampines right beside the Tampines Expressway is her residents’ little secret. With no HDBs, carparks, and definitely no minimarts, this nondescript piece of greenery may just seem like any other green patch in Singapore. However, a step into the park and you feel as though u have been transported into the outskirts of the city, surrounded by lush greenery and the songs of many chirping birds. Although relatively new, the park’s development was not intrusive and retains a ‘wild’ look. Dead trees that are not along the paths have been retained and have become a sanctuary for native and migratory birds, especially the majestic raptors such as White Bellied Sea Eagle and Brahminy Kite. Trekking around Tampines Eco Green is a great learning journey for everyone. Start with the Diversity Trail where it brings you along the wetlands and grasslands where you can watch the white breasted waterhen jostle for territory or be entertained by the dance of the dragonflies along the wetlands. Also keep a lookout for the majestic raptors that love perching on the many dead trees in the park before making loop through the Forest Trail for a nice shaded walk back to the entrance! For the longest time, this 24 km stretch of land was the gateway to Singapore, welcoming visitors to the garden city with a mixture of lush greenery and modern architecture in the distance. Although most of the railway tracks have been removed and patched over, revisit some of the historical landmarks and sights that once greeted many of our visitors who travelled by rail. Developments to the rail corridor were recently announced and while the masterplan is impressive and will cater to a wide audience, one should not pass up the opportunity to see and photograph it in all of its natural glory, before it loses its identity and its atmosphere. 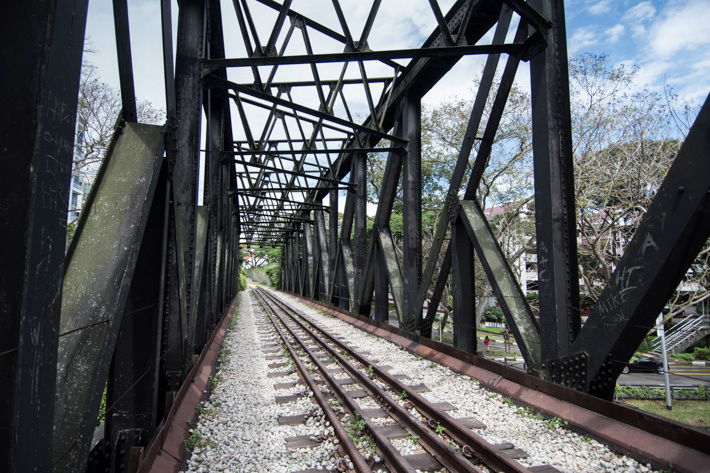 To thoroughly soak in the atmosphere of the rail corridor and fully appreciate the historical significance of the rail corridor, enter via the entrance south of the Rail Mall start from one of the iconic cast iron Truss bridges along the corridor. 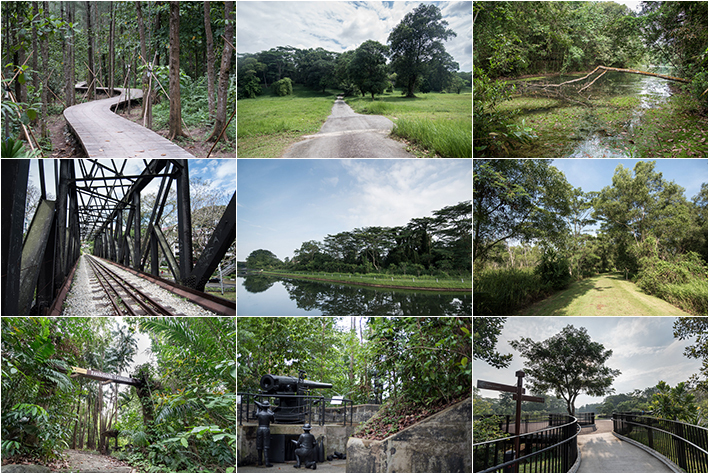 Take a slow walk down memory lane and keep a look out for the former Bukit Timah Railway Station and a second Truss bridge along King Albert Park, before ending the 5km journey at Holland Road. Have you heard of the celebrity family that resides in Bishan-Ang Mo Kio Park? No? Well, it’s none other than the family of 5 otters which have decided to make Bishan-Ang Mo Kio Park their home! Bishan-Ang Mo Kio Park (formerly Bishan Park) is a true marvel of the combination of landscape architecture and civil engineering brilliance. What was once a communal garden with a mishmash of themes and fishing ponds has since been transformed into a meandering river system that is not only biodiverse, it also serves as a stormwater management and water filtration facility. After an easy stroll “hunting” for otters and herons, cross over and go deep into the forest for an adventure at Lower Pierce Reservoir Park and hop onto the various trails in the park. The shade from the forest canopy and the well-maintained boardwalk makes trekking the Lower Pierce Reservoir Trail a breeze. Keep your eyes up on the tree trunks just under the canopy and you may spot a flying lemur chilling out or a flying dragon gliding from tree to tree. If you are lucky, you may even hear the rustling of the leaf litter that discloses the presence of the elusive Lesser Mousedeer! Finish the trek at the Casuarina entrance of the trail, which brings you right onto Casuarina road. There is no better reward than a good tzechar meal and/or a prata feast! Neighbourhood parks with exercise machines and beautifully landscaped gardens are all too common here in the Garden City, but how about a neighbourhood nature park? While it is much smaller in comparison to the larger nature parks and reserves, Springleaf Nature Park is no ordinary man made park. Steeped in history, the area was once a village named Chan Chu Kang where pepper and gambier (used for tanning leather) were cultivated. This was also where many iconic plants such as the Singapore Kopsia were first collected and described from! Get into the park early in the morning and be treated to a spectacular sight as the morning sun rises above the canopy, illuminating the park with a golden glow for photos that make fantastic screensavers! This is also when the birds are most active. Be serenaded by the melodious calls of the numerous black naped orioles that reside around the park, or watch on as a kingfisher dives into the river for a catch! Remember those history lessons about how Singapore was once deemed an impregnable fortress? It was believed that attacks, if any, would come in from the south of the island, thus the placement of many artillery weapons along the southern coast of our tiny island. 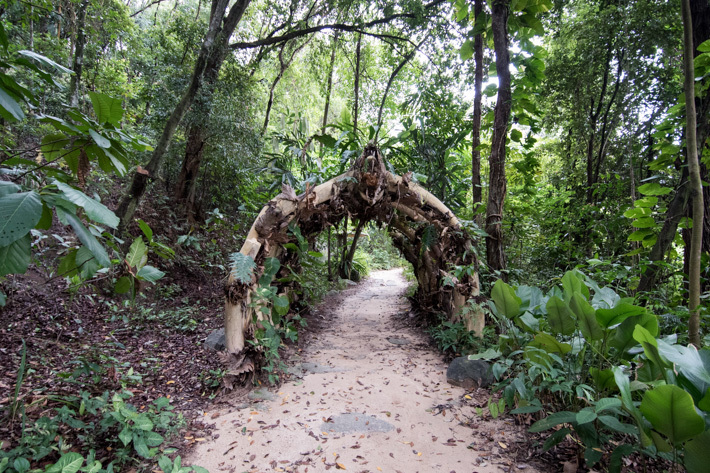 At Labrador Park, discover the hidden past of Labrador where artefacts and structures of what used to be a British military installations are scattered along the Nature Path under the canopy cover of the coastal forest. 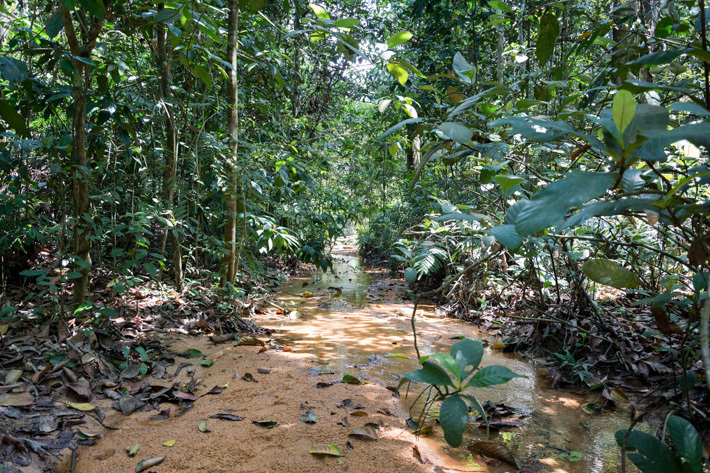 Even If you are not a history buff, a stroll along the Nature Path would introduce to you some of the more commonly seen coastal forest trees in Singapore such as the Sea Almond, of which its leaves are popularly known in the aquarium trade as ketapang, and are used as a water conditioner. After donating blood to the mosquitoes of Labrador, climb down the steep steps of the Coastal Path and onto the shoreline for a nice breezy stroll along the coast to dry yourself up before heading off. A nature lover, biologist and an avid photographer, Jeremy enjoys exploring the various trails and natural areas around Singapore, photographing interesting critters and documenting unique behaviours along his treks. Never one to shy away from an adventure, Jeremy is always keen to explore new natural areas in Singapore and to discover what hidden gems our nature areas have to offer. Hi Jeremy. You will find the Lesser Mousedeer in Lower Peirce Reservoir forest but not the Greater Mousedeer. The latter has not been recorded on mainland Singapore.